The week is only two days so far, but the oil crash in it has now been taken into elite company. The WTI benchmark is now down about 40% from its high set just a month and a half ago. As noted yesterday, this isn’t normal, healthy behavior. Crude isn’t exactly fickle, so a crash like this should be appreciated for what it says about this important market’s expectations. If history is a guide, nothing good. There is one false alarm around 30% (1994), but none over 40%. 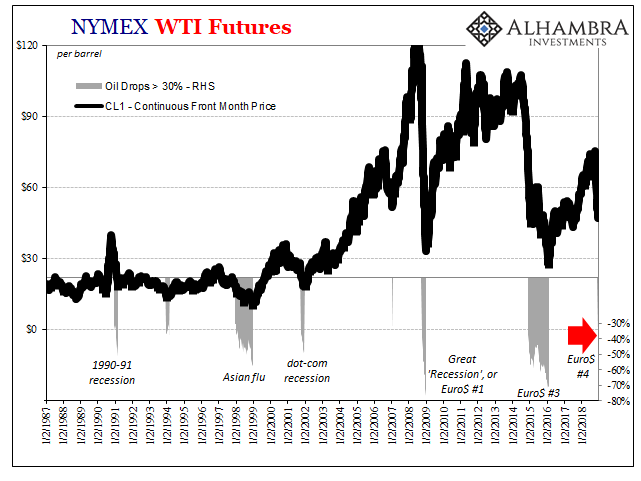 If oil declines by that much, then in the past it has meant some variety of downturn ahead. Supply simply doesn’t matter, when demand shifts nothing good comes out of a 40% crash. Even the first crude collapse in the panic cycle showing up in early 2007 was something policymakers should’ve taken seriously (liquidity). But they don’t ever. The reason is simple; Economists don’t trust markets, they steadfastly follow models that assume no matter how much evidence stacks up against them monetary policy always leads to success (growth). And for plainly dubious reasons. 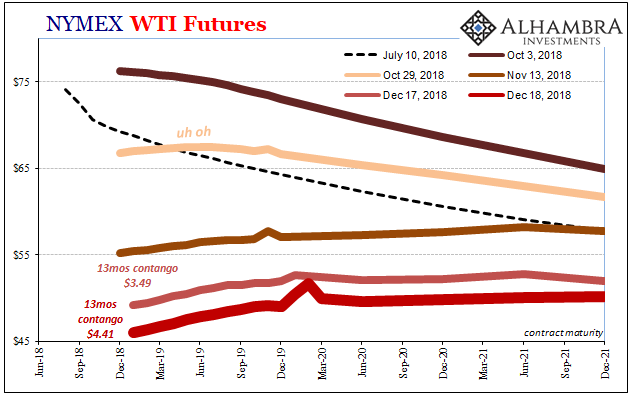 Equally momentous this week, the WTI futures curve has sprouted very deep contango. For most of the decline since October 3, the deepest point of contango had been maintained around $1 to $1.50. That’s serious stuff all its own, but now it has shifted to something much greater; more than $4 today. 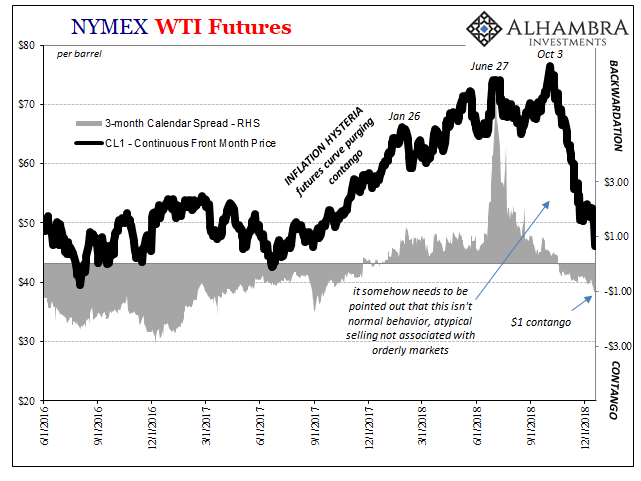 The message in the crude curve is therefore incredibly simple and consistent with the past – big problems ahead, serious deterioration. Whatever physical imbalance the market perceives right now for the near term and intermediate future, investors are positioning (and being positioned) for it growing worse, not better. Even with about 40% already. A big piece of that imbalance is financing, meaning liquidity therefore eurodollars. We can add this to other prominent market signals, such as the small inversion in a limited space on the UST curve, the wider but still relatively minor inversion on the eurodollar futures curve, plus the related collapse of inflation expectations. Swap spread compression.